My dear, sweet chickadees, we did a poll a couple months back about which shows KMWW should be recapping this spring/summer. The winners of that poll were Orphan Black and Game of Thrones, but there was a really strong turnout for Hannibal as well. So I've asked my very good friend Kyla Furey (also known as one of the awesome roommates I'm always talking about) to recap the show for us all. Without further ado, take it away Kyla! My dearest friend Debbi has asked me to join her blog for the current season of NBC’s Hannibal to do some recapping for you guys. This is in part because she is super busy with all the other media she has to watch/review/recap, and in part because I am so obsessed with this show that I lived-tweeted every episode for the second time in the lead-up to the season 3 premiere. If you’ve never seen Hannibal, I urge you to give it a chance. Even if you’re not normally a horror fan, even if you don’t like gore or scary things. Despite what you might have heard, the show isn’t really “scary,” not in the way you’d normally use the word. What it is, is dark. It’s dark, beautiful, sumptuous, and horrifying, but more because of the psychology of the characters than any gore in the series. The gore is present, but whenever it’s on screen it’s always beautiful, always so carefully laid-out and shot that it becomes a work of art more than an act of violence. This show looks like nothing else on TV - the care and beauty of its cinematography is on par with contemporary art films. It sounds like nothing else as well, as the amazing score by Brian Reitzell is strange and haunting and bizarre at times, but always appropriate for what it accompanies. 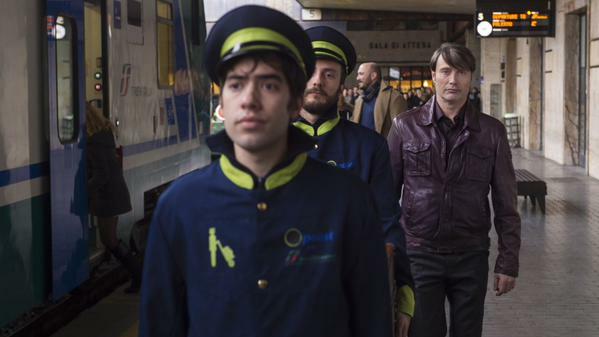 The lead performances by Hugh Dancy and Mads Mikkelsen are intense and subtle and brilliantly full of pathos. This is a show that’s really trying to push TV as a visual medium, and if nothing else it deserves respect for that. Plus the showrunner, Bryan Fuller, is also the man who did Pushing Daisies. So you should at least give it the benefit of the doubt. This past Thursday was the premiere of the long-awaited season 3 of the show. 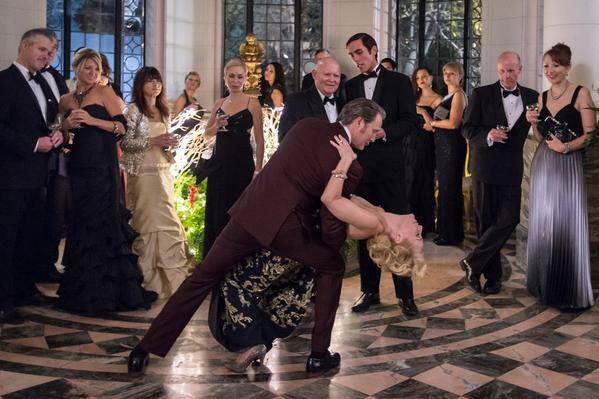 The new season of Hannibal starts off with a… well, not a bang, exactly. It’s not the sort of show that does bangs, really. Usually slices, more often. It does start off with Hannibal Lecter riding a motorcycle in Paris though, which is at least as good. 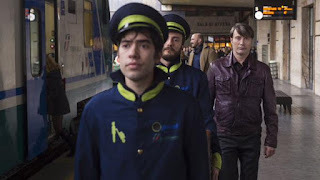 The episode “prologue,” for lack of a better term, is a short vignette of Hannibal’s new European lifestyle, complete with leather jacket, sumptuous cinematography, delicious murder, and really unsubtle flirting with European twinks who are in no way a substitute for Will Graham no really. The whole opening sequence reminded me why I watch this show, thanks in no small part to the ridiculous and amazing underscoring by the incomparable Brian Reitzell, like I said above. For those who have never watched - or, indeed, listened to - an episode of Hannibal, Reitzell doesn’t so much score the show as he does torture an orchestra in time to the cinematography. And I mean this in the best, most flattering way possible. This show doesn't look or sound like anything else on TV, and both of these qualities are strongly on display in the opening scenes. In his exploration of Parisian social gatherings and while pursuing his quarry of a snobby academic, Hannibal meets the embarrassingly thirsty Anthony Dimmond. 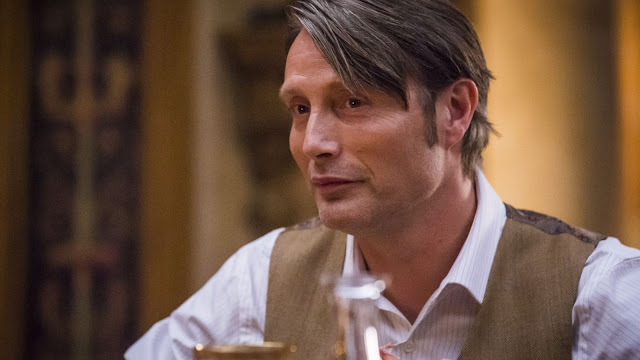 * Hannibal and Dimmond go their separate ways for now, and Hannibal follows this snobby academic (Dimmond’s former boss, apparently) to the man’s home and eats him - and possibly his wife - in their own dining room. I can’t help but be highly amused by this, because it makes me imagine what happened offscreen. Have you ever tried to cook in an unfamiliar kitchen? 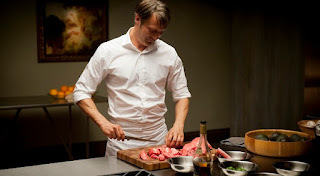 I’m just imagining Hannibal, dead body on the counter, opening all the cupboards in the place looking for salt. I wonder if this is a sort of Top Chef-style competition that Hannibal sets himself; “You must cook this man’s organs using only what you can find in his kitchen.” Anyway. And that really sets the tone for the episode; the tension of Hannibal stalking people with the intent of brutal murder coupled with a surprisingly hilarious undertone. I had forgotten just how funny this show can be, always in the darkest way possible. This first episode, like most of the series, is an exercise in tension, the paranoid and obsessive observation of the chrysalis of beautiful, slow-paced elegance, just waiting for the emergence of the nightmarish violence sleeping within. And that tension, when played out for long enough and juxtaposed with the mundanity of daily life, can become weirdly hilarious. 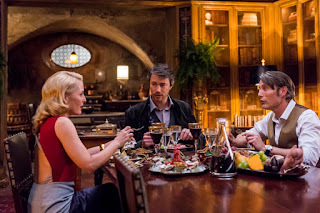 The episode is an interweaving of three storylines: Hannibal and Bedelia’s European tour, Bedelia’s history with Hannibal, and Hannibal’s gradual devouring of Abel Gideon. None of these are told from start to finish, and neither are they necessarily told linearly within themselves or relative to each other. Pieces of them are cut up and strewn about within and around each other, like a fancy narrative salad. Don’t worry, it’s less confusing than it sounds. Somehow they went from Bedelia threatening a naked Hannibal with a gun to cozy plane-mates, but as we see the unfolding of the episode it becomes a bit more clear why. Bedelia seems to be in equal parts Hannibal’s fascinated therapist and his terrified hostage. It’s unclear if she went with him because he threatened her if she didn’t - in his veiled, Hannibal sort of way of course - or if she just underestimated how horrifying it would be to do so. But either way, much of the episode is about her doubts and her feelings of being forcefully pulled into his world, drowning in the seductive darkness that surrounds him. We also see in the flashbacks Bedelia’s initial ensnaring in Hannibal’s extensive web, with tantalizing glimpses of the patient she killed under his influence. Said patient is played by a beautifully dead Zachary Quinto, which I assume means we’ll be getting more scenes about this encounter later. Otherwise that’s a lot to pay someone to play a corpse. This storyline beautifully parallels Hannibal’s entrapment of Abigail early on in the series, complete with the seeding of doubt and the offer to help “if you ask me to.” Because that’s the thing about monsters coming into your home - they have to be invited. In the main story, Bedelia is playing Hannibal’s wife while they enjoy new fake identities in Italy, and she clearly has mixed feelings on the subject. Every instant you watch her you feel her tension, her doubt about whether each moment will be her last, her internal debate over whether to just run for it. She almost does run near the end, only to be foiled by Hannibal’s last-minute appearance. There’s a great shot of her through a security camera at one point that highlights both her constant paranoia of being under Hannibal’s watchful gaze and her desperate desire to be seen by someone, to be noticed and given an out from this dreadful waking nightmare she finds herself in. The two conspirators have taken up residence in Florence by this point, where Hannibal has murdered and charmed his way into a position as curator of a local museum and an academic lecturer. Some of the people he’s working with are assholes, but he’s killed “hardly anyone” while they’ve been there because he feels like he’s starting to establish some kind of feeling of peace in this life. It’s difficult to get a bead on Hannibal emotionally in this episode (as it often is, with Mads Mikkelsen’s amazingly subtle acting), but our best hints come from the last of the three interwoven stories, Hannibal’s final days with Abel Gideon. Another set of flashbacks, this time in black and white. When we last saw Hannibal and Gideon in season 2, Hannibal was feeding Gideon his own leg. But when we last saw Gideon alone, the man was missing both legs and arms. These flashbacks are the tale of how he lost those remaining limbs. As Gideon steadily loses body parts meal by meal at Hannibal’s home, you can see him becoming more and more petulant about his situation, trying to irk Hannibal at every turn. He’s not afraid; he’s never afraid. But this seems to be because he has no illusions about his fate. He refers to their communal meals as “posthumous” because Abel Gideon knows he is already, inevitably, dead. As a side tangent: we now know that Abigail was alive during this time. Do you think she and Abel met? Did she help wheel him around the house? Or would Hannibal have been worried about what he might do to her given his past? Maybe she just sat in the basement, eating leftover Gideon steaks. At least now we know where some of the excess food was going, considering the ridiculously huge amounts of it Hannibal always made. But in his “death,” Gideon can be for Hannibal what Garrett Jacob Hobbs was for Will; a haunting spectre that helps us to examine the emotional complexities of the haunted. Unlike Will’s mind, Hannibal’s is presumably a very polite place, and so Gideon stays carefully in the realm of memory, rather than running amok in the hallucinatory subconscious like Hobbs did. At least for now. And what Gideon reveals about Hannibal is pretty interesting. Despite Hannibal’s claims that they are not equals, Gideon knows enough about Hannibal to know the core of what makes him tick. It’s Gideon who points out - near the end of the episode, a reveal - that what’s missing from this premiere is Will Graham. 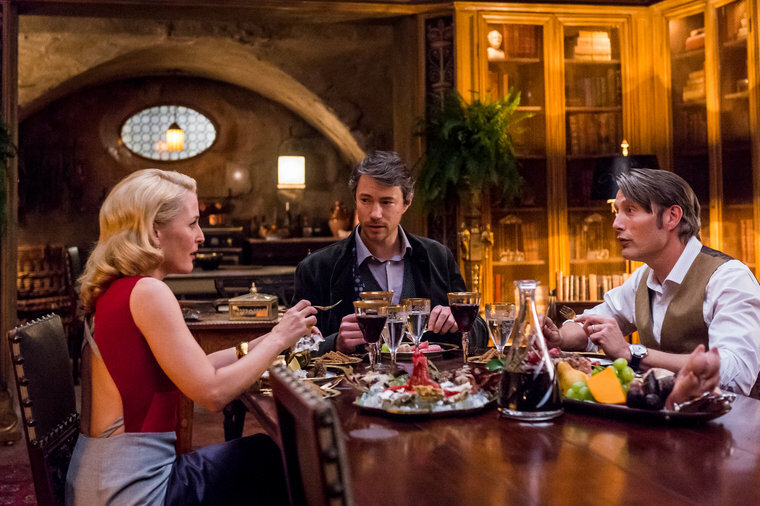 That Hannibal needs company like anyone else, and wishes he could share the dinner table with the person he really wants. So this, in a nutshell, is the Hannibal premiere: more of what we love about the show. It’s slow. It’s moody. It’s beautiful. It’s weirdly funny. It promises a dramatic build and inevitable violence. It’s very, very Hannibal. It's also just the beginning. This picture was chosen because Hannibal looks so smug in it. Seriously. So smug. Kyla Furey is an independent game designer and writer. She is also one of the hosts of the game-analysis podcast, Feedback Force. She enjoys the surreal and the moody in her media, hence her great love of NBC’s Hannibal. This is a show that’s really trying to push TV as a visual medium, and if nothing else it deserves respect for that. It certainly does. (If you've not tried it, Penny Dreadful is also pushing that bar, and has its own intense dark-heartedness running through every character). Have you ever tried to cook in an unfamiliar kitchen? I’m just imagining Hannibal, dead body on the counter, opening all the cupboards in the place looking for salt. They should really have shown some of that. What an amazingly wrongbutright way to show some vulnerability in our villain. I hope Will, if Will is still alive, returns soon, though. I like the show better when it's more about Will as the protagonist, with Hannibal more as a force in his world. Is Penny Dreadful worth watching? I'm torn on whether to try to pick it up. Strengths include amazing cinematography and music, excellent performances all round, moral dilemmas and emotional crises galore, and the oppressive atmosphere of old sins. Neutral to strength (could be a strength or a weakness depending on the genre, but given the genre is a Victorian-gothic mashup, I lean towards strength) every character is profoundly messed up. It does a good job of keeping your sympathies for them even when they commit horrible crimes, but still letting the crimes be horrible. Weaknesses include female sexuality tending to the demonic, the one black character being pretty much a cipher, and a rather neat piece of inclusion being drop-kicked in favour of a cheap fridging. I think it's worth your time, especially given that each season is only eight episodes. It also has the single most unexpected (for me anyway) murder on any show I've ever seen).